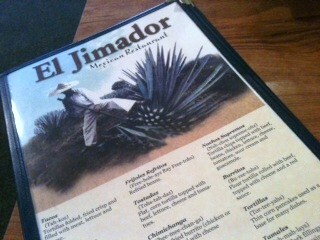 El Jimador was the second Mexican restaurant that opened in Farmington. They opened for business on May 8th, 2008. A "lunch only" menu is served until 3 p.m.
2011-05-09 12:03:39 I was a bit shocked that El Pacifico had gotten such bad reviews and that El Jimador had gotten good reviews! Maybe you'll like it as taste for Mexican food is very regional...but I've been there twice and I call it El Jima-yuck!